Build. Drive. Collect. That's the way you live your own cars dream! 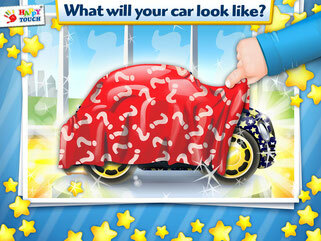 In the funny Dream Cars Factory you can create your own dream cars all by yourself. There are endless design options (first choose the car body, then the colors, windows, rims, tires,... and lots of weird and wonderful accessoires and special features!). A police car with flowely wheels? A rocket-propelled sports car? A yellow bus with red wheel rims and rotors on the roof? A golf car with a flashing blue light? Let your imagination run wild and create cars that have never been seen before! Then you head on down to the racetrack. Enjoy your drive by day or by night, in the desert or through the green landscape. You can collect all your dream cars in the huge garage (no limit!) and drive them again whenever you want. Which car would you like to drive today?! The free version is completely playable with one car. 17 cars and way too many special features to count wait for you in the full version. Made for kids aged 3 and above. Sin sonido en el juego de carros. Tengo la app comprada.